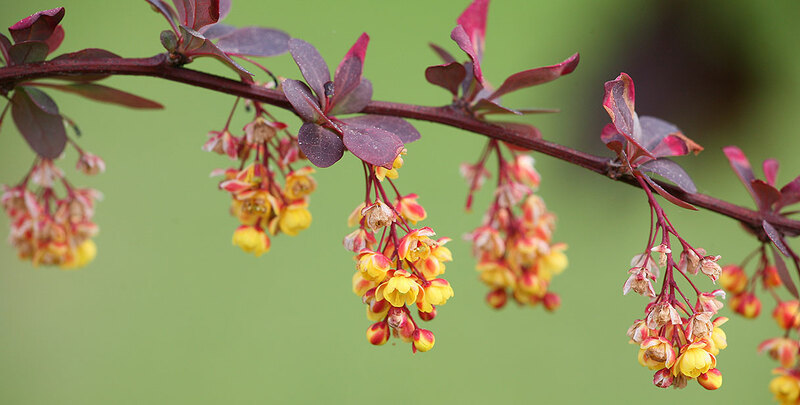 Japanese barberry, also known by its botanical name berberis thunbergii is a deciduous barberry species which makes excellent low, formal hedges. Due to its ultimate height of 1.50 to 2 metres and the fact that it sheds its leaves in the autumn, Japanese barberry is not ideal if you are looking for a screening hedge. However, it does make an excellent intruder hedge, as its stems are equipped with strong, prickly thorns. Because of this, Japanese barberry hedges are often planted under windows in order to discourage unwanted visitors from entering the house. A Japanese barberry hedge is not without its ornamental value though, as it boasts yellow flowers from mid-spring to early summer. After flowering, bright red berries appear on its branches. When it comes to soil requirement, Japanese barberry is a very undemanding plant. It will feel well in just about any soil, as long as it is not too chalky. It has a preference for somewhat moist soils that are rich in humus, but will still perform well if the soil in your garden is relatively dry. If you plant your Japanese barberry hedge in the sun or partial shade, it will thrive. Although it only grows 10 to 25 centimetres per year, pruning your Japanese barberry hedge is essential, as it is prone to becoming invasive. Due to its thorns, this may be an unpleasant prospect, but as long as you wear protective clothing, you should be able to keep it in check unscathed. We highly recommend removing dead wood in the winter and summer, while trimming the hedge to shape is best done after berrying. If you like the appearance of the Japanese barberry, but are still looking for something a little bit different, you could consider planting a purple Japanese barberry hedge in your garden. This barberry variety looks very similar to berberis thunbergii, with the most notable difference being the reddish purple look of its leaves. There are also evergreen barberry varieties, which are highly ornamental due to the glossy appearance of their leaves, that – naturally – remain on the plant throughout the winter months. All of these varieties are equally suitable to serve as an intruder hedge, but it is worth noting that none of the other types of barberry available for hedging in British gardens grow quite as tall as the regular Japanese barberry does. While many people looking for a barberry hedge choose to plant one of the evergreen berberis varieties in their gardens, the deciduous Japanese barberry has a number of qualities that the evergreen species just do not have. Not only does Japanese barberry grow significantly taller than the evergreens, it also has a stunning autumn colour that is one of the biggest advantages of its deciduous nature. The fact that it sheds its leaves does not diminish any of the value the plant has as an intruder hedge, as Japanese barberry is quite hardy and therefore, its tough, sharp thorns are not harmed by the cold in any way.